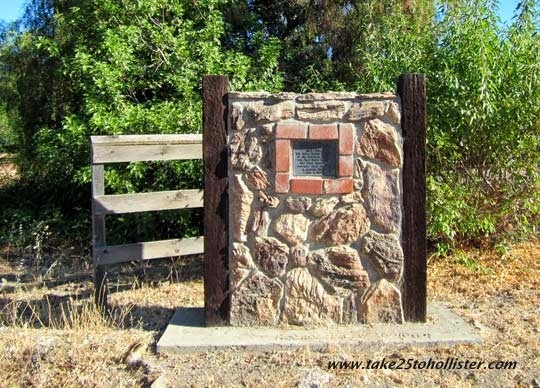 Standing at the corner of Fifth Street and Highway 25 in Tres Pinos is an E Clampus Vitis plaque commemorating the Tres Pinos Hotel that was there from 1873 to 1958. The hotel was originally known as the Southern Pacific Hotel, which Southern Pacific built when it brought the railroad to Tres Pinos. 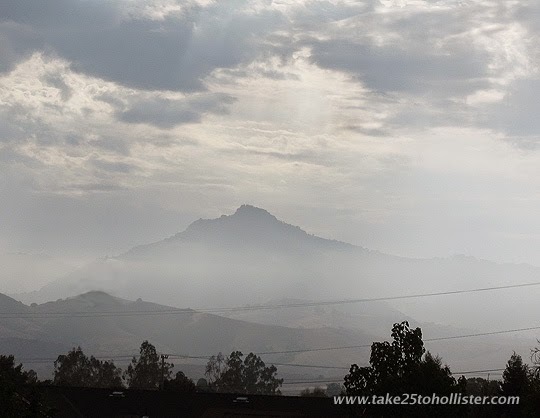 If I understand the various references correctly, Juan Etcheverry, who owned 1,400 acres of land in and around Tres Pinos, took over the hotel and it became known as the Etcheverry Hotel. ". . .the hotel was a bustling place. It was to Tres Pinos what the Plaza Hotel was to San Juan. Hay and grain buyers and stockmen would come and stay. The train would stop overnight before going back so the railroad men also were guests. The station was across from the hotel and the turntable was a short distance away. In the kitchen there were three Chinese cooks to handle the busy dining room. There was a pool room, a public room with a fireplace and poker tables, and a bar which was probably called a saloon in those days. . . ."
Yes, yet another view of the Old Elk's Lodge from me. This one is so much better than the one from the other day. On August 4, Muenzer's will have been in business 104 years. Owned by siblings Jerry Muenzer and Jan Holthouse, the establishment is formally known today as Muenzer's Keys and Teez. 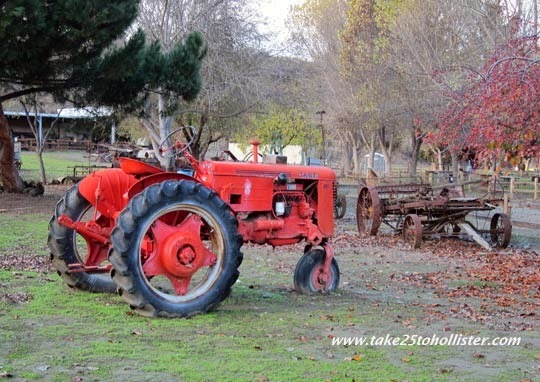 It offers locksmith services and sells Haybaler sweatshirts and other apparel. The business was opened in 1910 by the siblings' grandfather, Joseph Muenzer, who purchased a second-hand store, got rid of everything but the bicycles, and added locksmith services. Over the years, Muenzer's evolved and adapted with the community's needs and the economic times. Muenzer's is located at 217 Fifth Street. 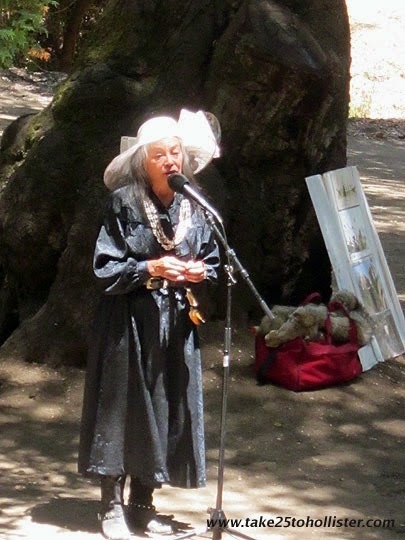 Today, the San Benito County Historical Park is having a Park Appreciation Day. The free event starts at 11 AM with the Early Day Gas Engine & Tractor Association Show, which ends at 3 PM. There will be a rededication of the Fire House at 2 PM and a rededication of the Dance Hall at 3 PM. People are invited to bring a picnic lunch. Food and drinks are available for purchase. There's a new restaurant in town. It's called La Catrina. I have yet to go, but I've heard some good reviews by folks who have given thumbs up on the quality of the food and customer service. "La Catrina is the feeling, the energy, and the authentic taste of the Mexican Grill," states the owners on the restaurant's Facebook page. 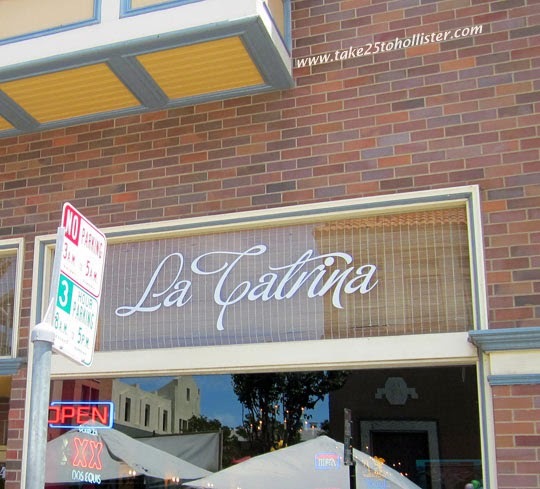 The restaurant is located at 449 San Benito Street, near the corner of Fifth Street. 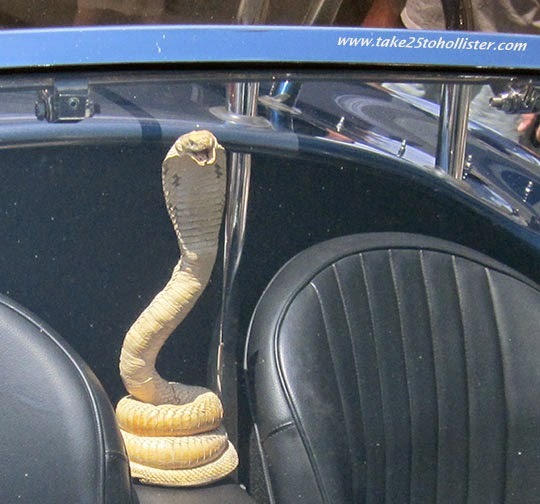 I get a kick out of the things that folks display inside their automobiles at car shows. 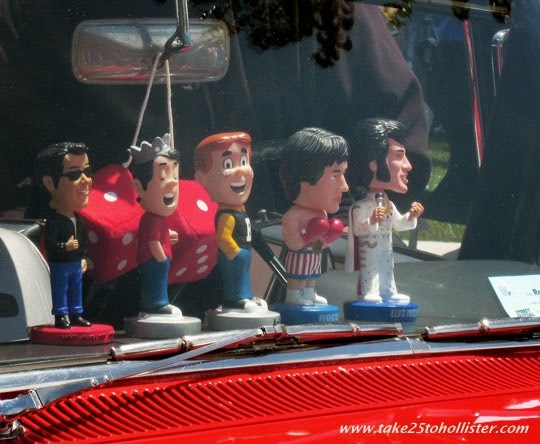 Did you happen to see this snake and these figurines at the Hollister Street Festival & Car Show last Saturday? 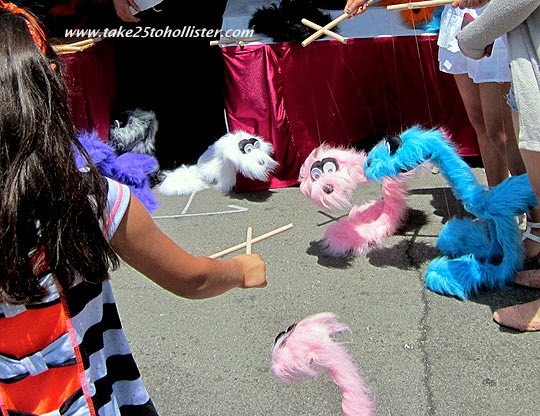 The puppet booth at the Hollister Street Festival and Car Show last Saturday was hopping with cute furry animals. I first learned about Soul Sweets at last year's San Benito Olive Festival when I followed the delightful baking aroma of something mighty delicious to its booth. I didn't get a chance to eat one of their berry cobblers, but the Husband did and he still ooohs when he talks about it. 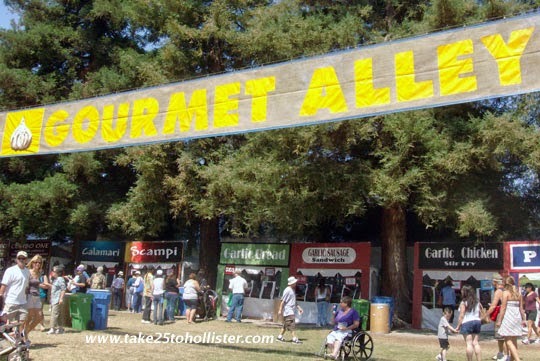 I'll finally get the opportunity now that Soul Sweets will be at the Hollister Farmers Market, starting tomorrow, Wednesday, July 23. 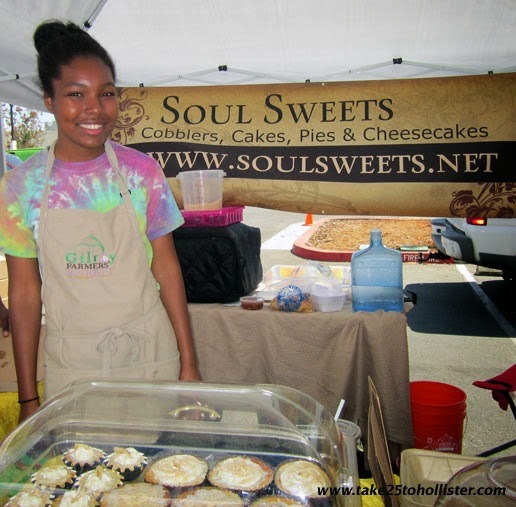 Soul Sweets is based in Morgan Hill. Check out this article about Dawn and Anthony Randolph, the owners, in the Morgan Hill Times. 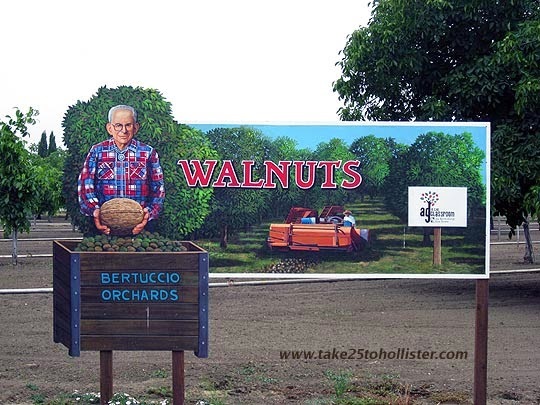 Besides the Hollister Farmers Market, you can find their baked goods at the Gilroy and Morgan Hills Farmers Markets. To learn more about Soul Sweets, head over to their website at www.soulsweets.net, or their Facebook page. We've been having some interesting weather lately. Strong winds whooshing through. Mugginess in the air. 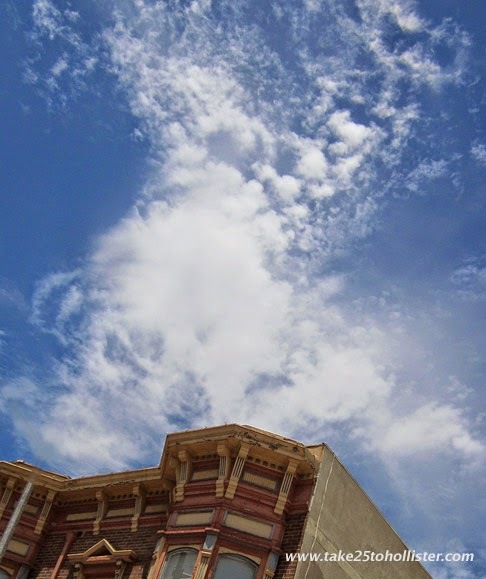 And amazing cloud formations. 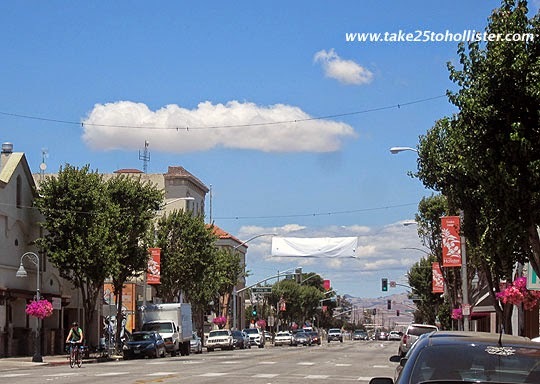 I saw this glorious cloud pattern above downtown Hollister yesterday at the street festival. Maybe rain is on its way. 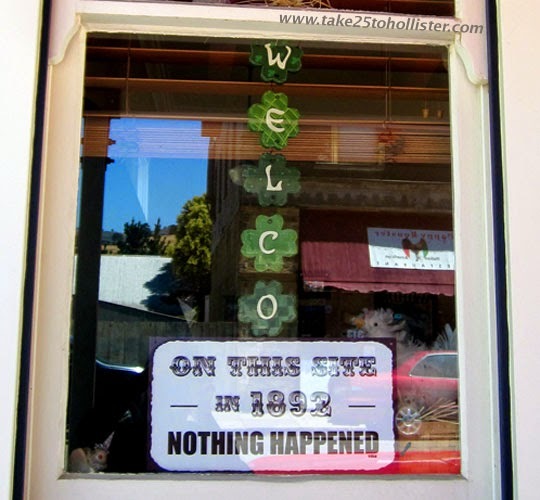 This sign in San Juan Bautista always cracks me up. But, I wouldn't be surprised if something did happen on that particular spot on Third Street. It just happens all of a sudden. You notice a completely different view of something so familiar. That's what happened to me at the Farmers Market this week. 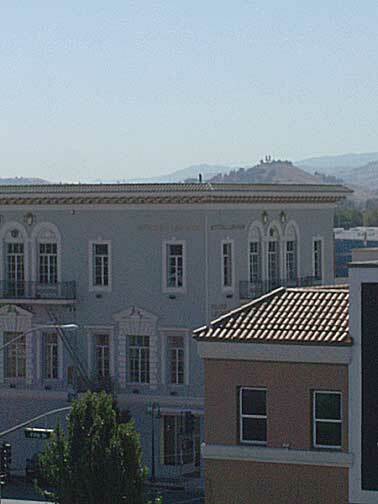 While talking with someone, I glanced up the street and noticed that the beautiful piece at the top of the old Elks Lodge Building (on the southeast corner of Fifth and San Benito Streets) does not extend to its south side. I wonder why. 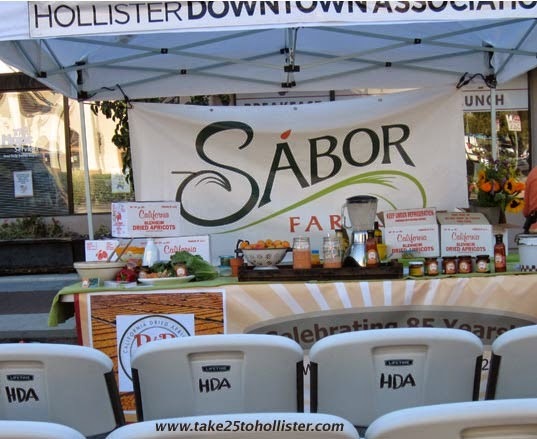 This year, the Hollister Farmers Market has added cooking demonstrations, which are given across from the Veterans Memorial Building. Every week is a different theme. 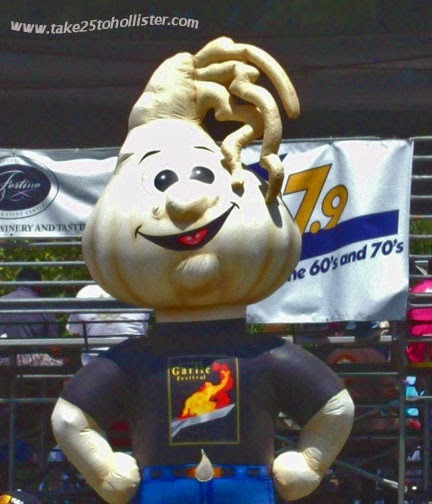 So far, local farmers and agricultural organizations have presented ways to prepare artichokes, mushrooms, cherries, stone fruits, corn, and Blenheim apricots. Yum! The demonstrations are given at 5:30 PM and 6:45 PM every Wednesday during the Farmers Market, which runs from 3 to 7:30 PM. 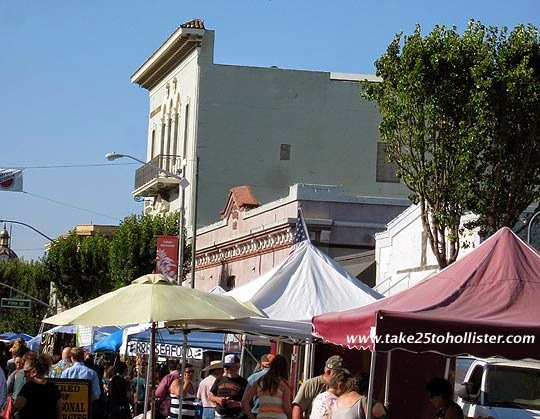 For more info about the Farmers Market, visit this page at the Hollister Downtown Association website. 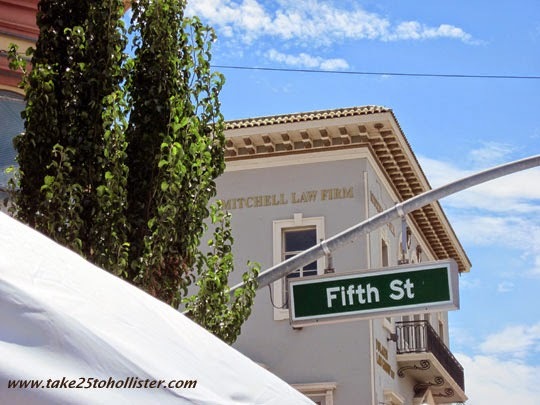 It's nearly time for the 2014 Hollister Street Festival and Car Show. Whooo-hooo! 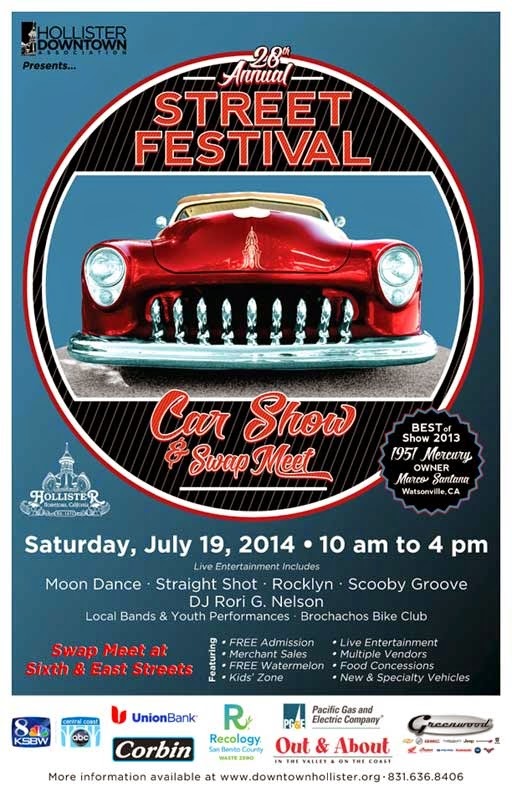 It's this Saturday, July 19, 2014, from 10 AM to 4 PM. So, mark it on your calendar if you haven't already. 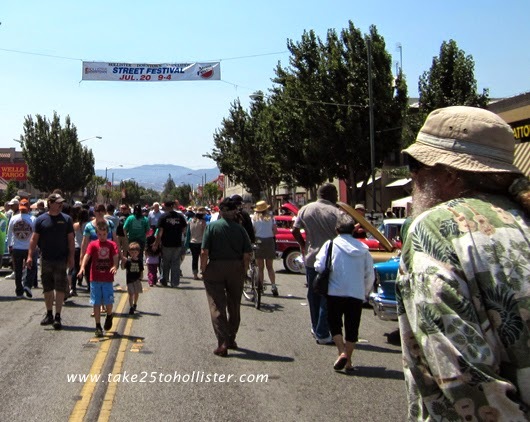 This annual free affair in historical downtown Hollister is organized by the Hollister Downtown Association. San Benito Street will be closed between Fourth and South Streets, as well as Fifth, Sixth, and Seventh Streets between San Benito and Monterey Streets. More than 150 vintage and new automobiles will be on display throughout the area. There will be a Kids Zone, a beer and wine garden, and two stages for bands and live entertainment, as well as various vendors and food booths lining the streets. The event will also feature an automotive swap meet. 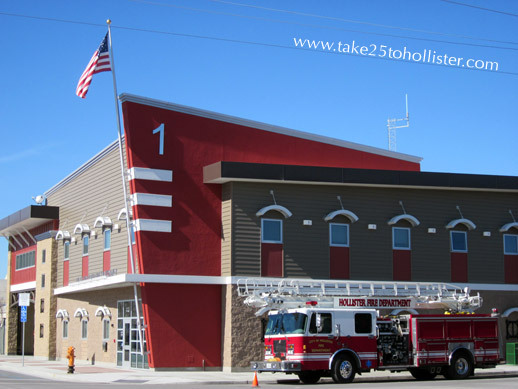 For more details, check out this page at the Hollister Downtown Association website. 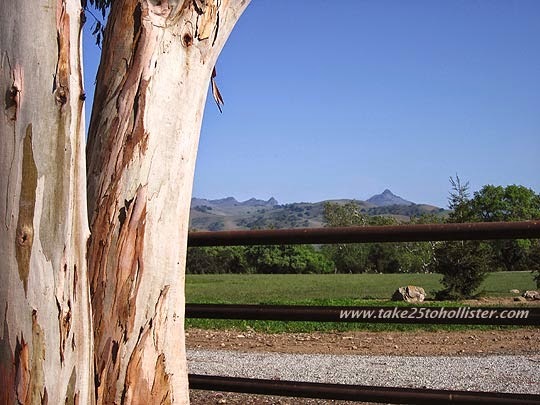 And, if you'd like to see photos from last year's event, head over to this Take 25 to Hollister album on Facebook. 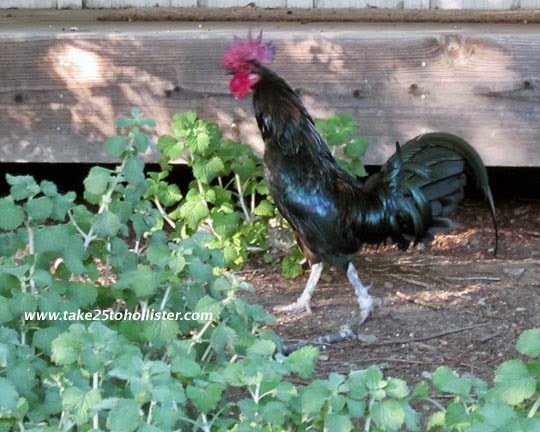 The Wednesday's Farmers Market in downtown Hollister is great for people watching. 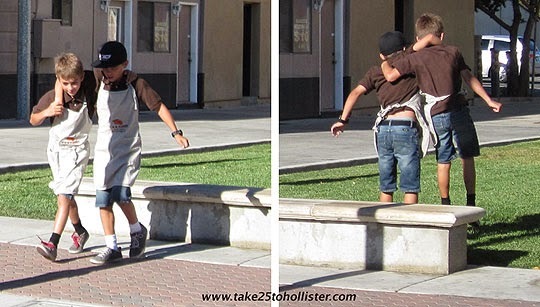 I enjoyed listening to the band play as I watched these two boys work out a routine of walking in step, turn, run, then jump up and off a bench. 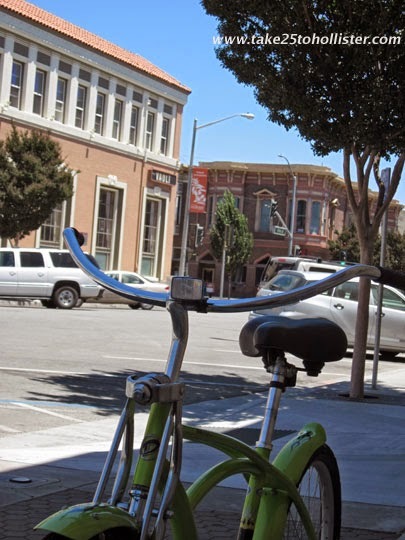 It's really nice to see the recent surge of people—young and old—pedaling bicycles from cruisers to ten speeds on the streets of Hollister. 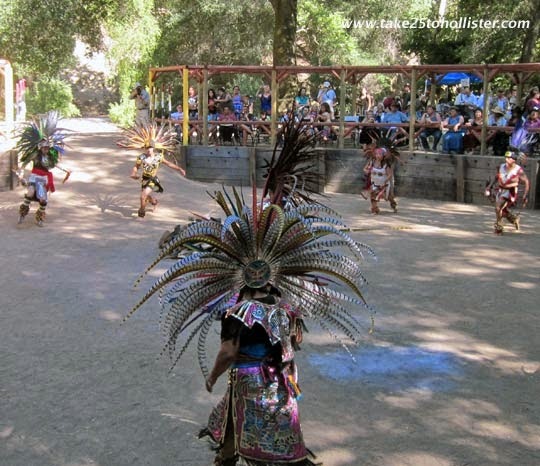 When I was growing up in Hollister 500 years ago, kids on bicycles were all over the place. At least on my street, they were. The first time I pedaled a bicycle on my own, I felt a wonderful sense of fun, freedom, and independence. I still do. If you're thinking about purchasing bicycles or looking for group bike rides in the countryside, check out Off the Chain Bikes, an independent bicycle shop owned by a very helpful Brian Lucas. 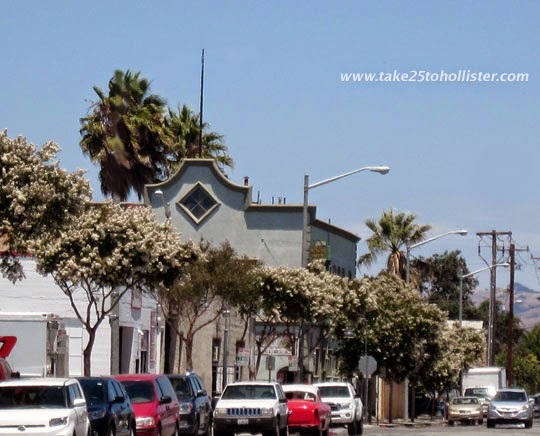 We've got a lot of old gorgeous commercial buildings in downtown Hollister. How often do we pass them by without noting their beauty? For instance, look up at the building at the corner of East and Fourth Streets. You get a better view of the building's design at the top as you approach it from the south on East Street. It looks like construction of the Santana Ranch development on Fairview Road, between Hillcrest Road and Sunnyslope Road, has begun. Hello, houses. Good-bye, open space. It was nice seeing you. The Summer Band Camp performed "God Bless America" while marching behind Uncle Sam, Betsy Ross, and a Cutie Ballerina at the Fourth of July Kiddie Parade. This annual parade doesn't get much notice, but it does get bigger and more organized. Kids of all ages are welcome to participate. Be sure to put it on your calendar for the 2015 Independence Day. 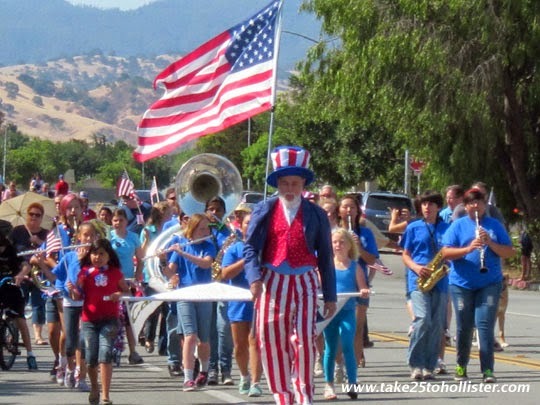 If you'd like to see more photos of the parade, check out this Take 25 to Hollister album at Facebook. You don't need to be a member or sign on to view it. 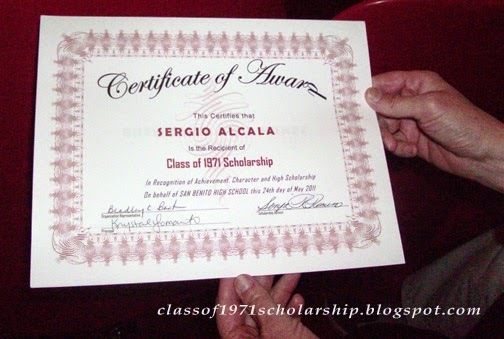 Please drop me a note if the link is broken. Remember Mr. Roger's Neighborhood. 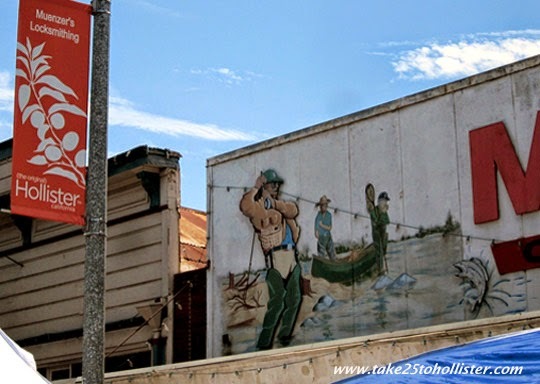 Looking at this photo of downtown Hollister reminds me of the song. "It's a beautiful day in this neighborhood. 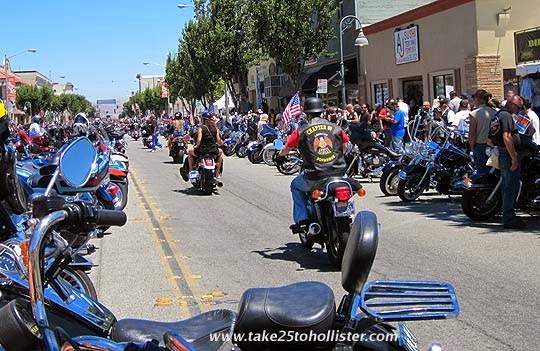 . . "
Many thousands of bikers are expected to visit Hollister over the Fourth of July weekend for the Hollister Rally. The free event will be open on Friday and Saturday, from 9 AM to 9 PM, and on Sunday, from 9 AM to 3 PM. 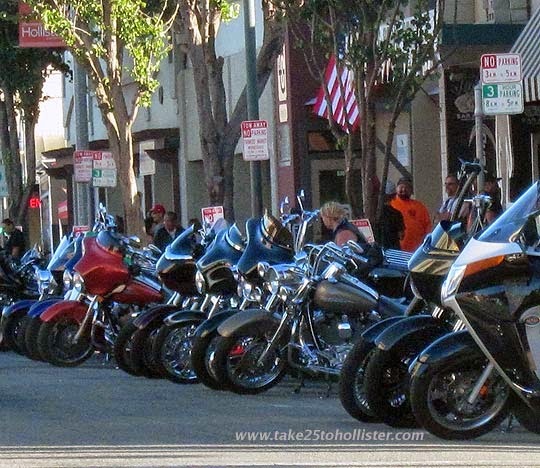 San Benito Street will be an amazing sight with motorcycles of all sizes and types parked on both sides of the street throughout downtown. Various bands will be playing on three stages—East Street, 4th Street, and 7th Street—throughout the event. Lots of good food will be available at the Food Court on Sixth and East Streets, and two beer gardens will be open at Fifth Street and Seventh Street, both off San Benito Street. 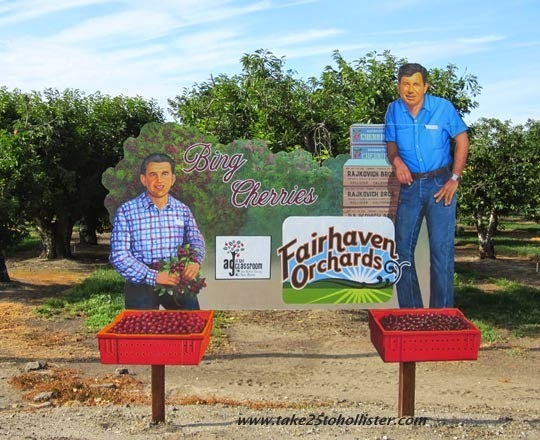 For more information about the schedule and vendors, go to the Official Hollister Rally website. 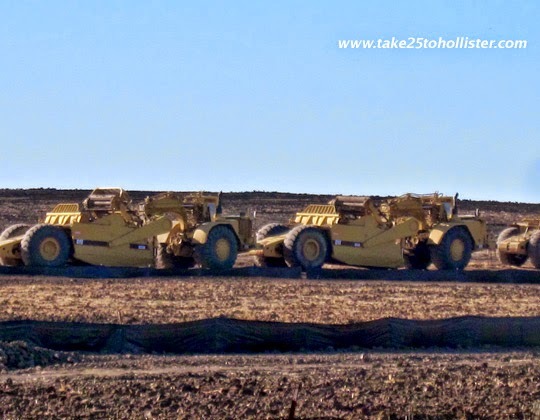 Tomorrow, the town will be setting up for the rally. The following downtown streets will be closed from 6 AM to midnight. Update: San Benito Street will close to traffic at 8 PM. The city parking lots downtown will be closed as well. For specific details, click here. A first aid station will be available at the Fire Station on the corner of Fifth Street and Sally Street. Police Chief David Westrick has it all covered. 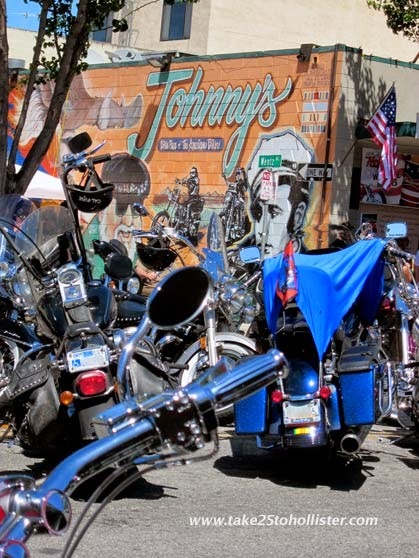 If you want to know specifics, read this article "Police Prepared for Biker Rally Crowds" by Adam Breen at BenitoLink.com. The official Fourth of July fireworks display will be at the Marguerite Maze School on Meridian Street, about a mile east of downtown Hollister. Fourth Street turns into Meridian Street at the intersection after the railroad tracks. The fireworks show will start at 9:15 PM. The Hollister United Methodist Church, at the corner of 5th and Monterey Streets, will have an All-You-Can-Eat Breakfast from 8 AM to 12 noon on Friday, Saturday, and Sunday. The breakfast includes pancakes, scrambled eggs, sausage patties, orange juice, and coffee. Admission: $12 for adults and $6 for children (12 and under). St. Luke's Episcopal Church, at 720 Monterey Street (by 7th Street) will be selling lunch, featuring linguica, for $6 from 10 AM to 3 PM on Friday and Saturday. They will also be offering bike parking on those dates for $5. 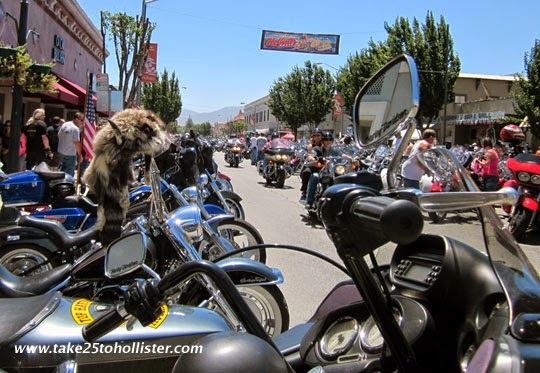 Around ten in the morning of July 4, 2014, while bikers begin rumbling into Hollister and parking their metal steeds on main street, the most adoringly sweetest, and shortest, parade of Hollister shall march along Memorial Drive, from Hillcrest Road to Meridian Street. 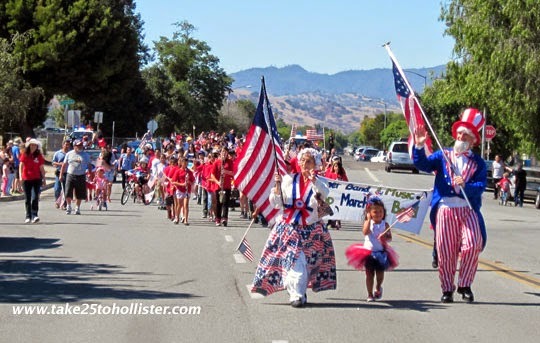 The annual Fourth of July Kiddie Parade is my favorite of all the parades that we have in Hollister. What's not to like! It's all about the younger children. Bicycles, scooters, wagons, and strollers, as well as many of the kids, are dressed in 4th of July glory. The boys and girls follow Uncle Sam and an all-kids band, as they walk, scoot, roll, and pedal the few short blocks to Marguerite Maze School. Many of them have their parents, grandparents, older siblings, and other adult relatives alongside them. Everyone—of all ages—is welcome to march in the parade. If you and/or your kids are interested, you need to line up at the Veterans Memorial Park parking lot (corner of Memorial Drive and Hillcrest Road) by 10 AM. Spectators: It's truly a short parade. So, if you want to see it all, be sure to get to Memorial Drive, between Hillcrest Road and Meridian Street, by 10 AM, too. For photos of last year's sweetest parade, please click here.